While the Fast & Furious franchise soldiers on after the tragic loss of Paul Walker, there’s no stopping the cast from driving badass cars. The National Corvette Museum took the time to highlight one of the stars and their car, which happens to be Michelle Rodriguez, or Letty, and her 1966 C2 Corvette. Michelle Rodriguez filming with the 1966 C2 Corvette. The 1966 C2 Corvette is finished in Rally Red, and is one of 3,366 finished in the factory color. It also arrived with standard Holley carburetors, vertical style Corvette scripts on the hood and a square mesh grille. These minor details make it easier to call out a 1966 versus an earlier model year. While we don’t know the plot behind Fast 8 yet, we are certainly looking forward to seeing Rodriguez behind the wheel of this gorgeous Corvette. So she’s driving a replica of the now famous “Big Red Corvette”. Cool. 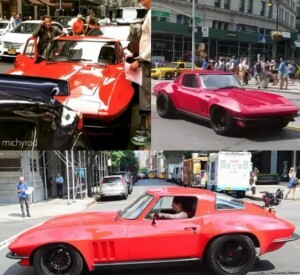 Hopefully they represent the car far better than the did when they had the actual 69 Big Red Carmaro in Fast and Furious (FF4). Stuart Caplan on:Will Chevrolet’s NASCAR Fortunes Turn At Talladega?